Borrow a copy of the Necronomicon ex Mortis from your local library and make yourself familiar with the fiends you may encounter when performing the rite. Do not act like a novice and read aloud! Instead fashion a fascis from fresh branches of rosemary, myrrh and juniper. Brush your arms, legs and top of the head to cleanse yourself and chant the phrase of power! “Flame for miniature so fatal, reveal my future magic ladle! Bring forth some blessed fine salts and fashion two circles. One just big enough to hold the miniature and your components and a more ample one around the first for you to stand in. Make sure the circles are not interrupted or disturbed. Take a miniature or some leftover metal sprue. Miscasts work well or especially ugly miniatures. Make sure the miniature is possessed. If you only have some sprue at hand make sure it is desecrated. You will need a finely crafted ladle. Naturally I use our family ladle that can be traced back to Johann Georg Faust. It is said he made a pact with the horned one to acquire this artifact, others say he bought it in the local shoppe. Arrange four candles made of rendered Basilisk fat and four receptacles filled with magical components around a leather cushion. I prefer my cushion of Demigryph leather and so should you. You will need the following components: Wyrmbane berries, the scales of a blue dragon hatchling, fine copper flakes and finally quartz shavings. Make sure all this is placed INSIDE the circle of salts, if you value your soul. A mighty component chest. Note the splenderous dice used in an obscure diversion I enjoy with my fellow wizards once in a while. Place the possessed miniature or desecrated sprue and the ladle on the cushion, light the candles chanting the phrase of power in a deep sonorous voice five times. Flashing lights, the smell of sulphur, mischievous voices and even apparitions may try to confuse your mind. Do not step out of your circle of salts nor reach for the ladle or the miniature. I feel I should have told you this first….oh, well. Use the fascis to cleanse the putrid air around the miniature after you finished your chant, only then reach out and place the miniature or sprue in the ladle and expose it to the flame of each candle you placed, but rest it over the last one. When the lead is fully molten pour it in a dwarven cast caldron filled with myrrh infused water. You can also add fresh pedals of the Himalayan mountain rose should you have some at hand, as it will enhance the potency of your water. Pictured again this year: My personal wizard’s refuge. Remove the metal shapes from the water with gilded pincers and dry them with a silken cloth. 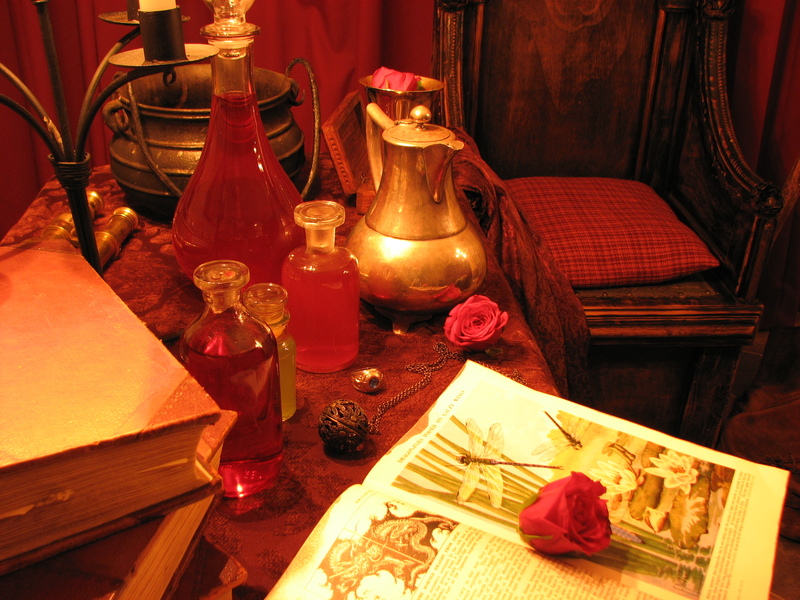 Now place the shapes on the cushion of leather and compare them with the Book of Divination. I was able to fend off rivaling wizards and protect the “Book of Divination” from prying eyes and jealous parvenus. 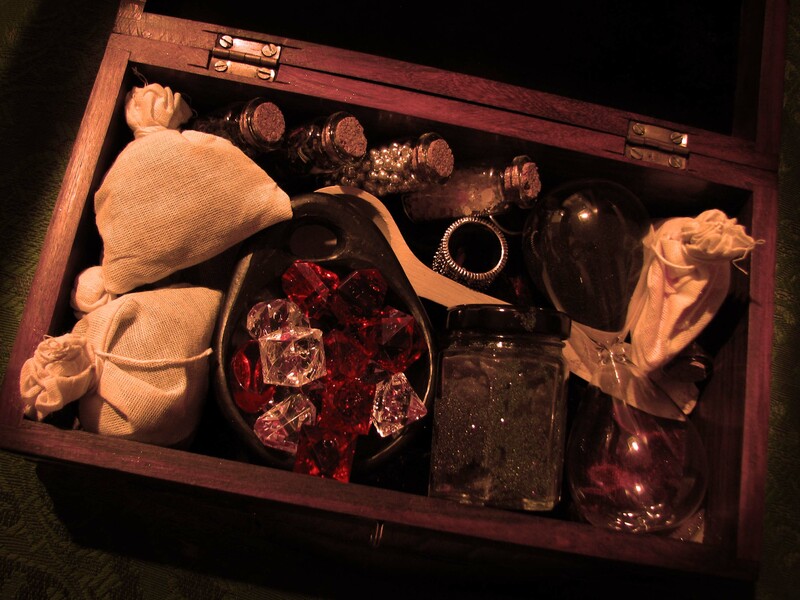 Using empowered ‘Read Magic’ spells the list of shapes and their meanings could be extended. Blessed be Mystra! Boot: You cannot resist and support even more Kickstarters in the new year. There will be lots of delays and you could kick yourself for again falling for the shiny. Brush: A glorious year of productive painting lies before you, ripe for the taking. Not the sad looks of the unpainted miniatures on your work bench will haunt you in your dreams, no the divine light of fully painted, well presented miniatures will fill you with satisfaction. Dice: The dice gods are with you this year. You will roll a great many sixes and smite the ones! Dragon: You buy a dragon miniature. It twists your mind and greed is making you buy even more miniatures for your hoard. You also emanate a sulphuric smell and growl at people coming too close to your miniatures. Droplet of blood: You are keen to finish some conversions and cut towards yourself! Ear: You decide to be a better listener if it comes to YouTube tutorials and podcasts. Your skills will improve accordingly and your wargaming year will be very productive and entertaining. Fire: You fall in love with a new rule system, burning all bridges behind you and pursue this new path with fiery fervor! Horse: You made a grave mistake and bought a whole lot of cavalry. You will spent most of your time painstakingly painting markings. Mountain: Your lead mountain will grow further until it darkens the sun and you can assume your rightful place on the throne on its top, the Iron Throne (made of miscast miniatures). Musket: You will become obsessed with the Seven Years War or the Napoleonic Wars. Because both periods are super interesting and have fancy hats and moustaches. Resistance is futile. Penguin: You spent a lot of time crafting snow terrain and even paint up a little penguin miniature. Alternatively you turn into a malformed super villain with a top hat. Pouch: You find a hidden treasure under your sofa while cleaning up. You wisely invest the money in more miniatures! Shell: Water-themed terrain is all the rage lately! You shall create a water- or beach-themed piece that puts Poseidon to shame! Skull: You fancy to start a new army and decide to go for Undead. You might get caught in some discussion which company’s Undead are best, but in the end you will see the light and just go for the once you like best. Slug: Your painting speed will slow down and your lead mountain will grow ever more imposing/intimidating! Splodge of Paint: While painting you will underestimate the pressure built up in one of your dropper bottles and squeeze a bit too vigorously. The carpet and wall paper will thank you later. Staff: You learn about arcane secrets and start a second career as a powerful wizard travelling the multiverse or you just get old. Sword: Adventures await! Only the gods know where and when and what, but it will be glorious! Really! Tears: …of joy naturally! You finish a project that went on for years. You almost gave up, but invigorated by knowing the future you succeed at last! Tree: You got inspired by a certain tree enthusiast and begin to build a whole forest of oak trees. You will fasten them to a hat and wear it to all of your games and call yourself treebeard from now on. And what did the lead reveal? A penguin and a shell *gasp*. Do you see the same? Do you think I am crazed by lead fumes? Let me know below in the comments. The lead revealed…a shell and a penguin! Oh, blessed be Azuth! Apparently snow terrain is also prone to be covered this year! Glad I already did some experiments with snow and icicles. I even have a penguin miniature from a Kinder Surprise egg. Good, very good. Just as planned. So far, so foreboding, but did anything foretold last year come true? So I will build up a Frostgrave warband, listen to more Podcasts and Youtube tutorials and either paint even slower or will be eaten alive by crab people! Yay! Again the lead did not lie! Blessed be Azuth and Mystra! I did indeed do a bunch of conversion work for a Frostgrave warband and got well stocked to build some Gnolls and Men-at-Arms, too. I also experimented some more with snow themed terrain. Even the undead come out of hiding when snow tutorials are planned! I also found some very good YouTube channels. One I can recommend wholeheartedly is Luke Towan’s channel. 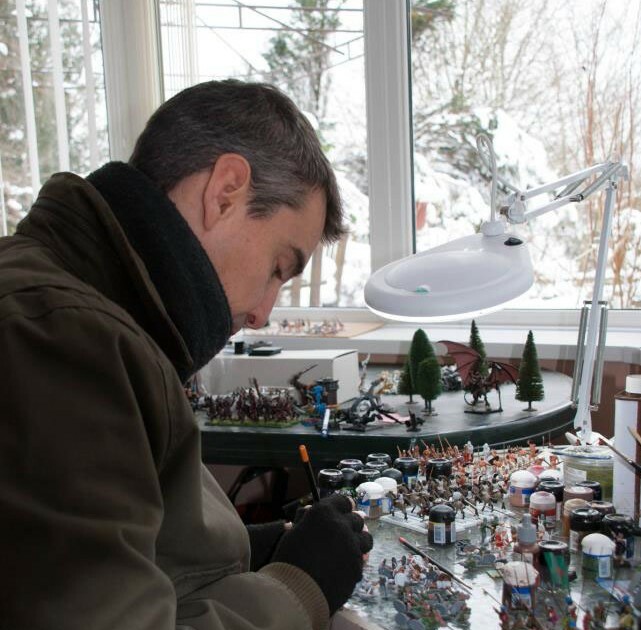 While he focuses on model railroad scenery, many of his tutorials can be applied to our hobby, too. The production quality is outstanding and the tutorials a very easy to follow. Check it out! I did also paint even slower! Yay! To be fair, I started a number of conversion and painting projects, but failed to finish them as of now. I do enjoy some variation, but I really want to try focusing on some core projects this year without getting sidetracked all the time. I also fended off an invasion of crab people, but I don’t want to bore you with details. I can say so much: it was delicious. What is in store for my readers in 2017? 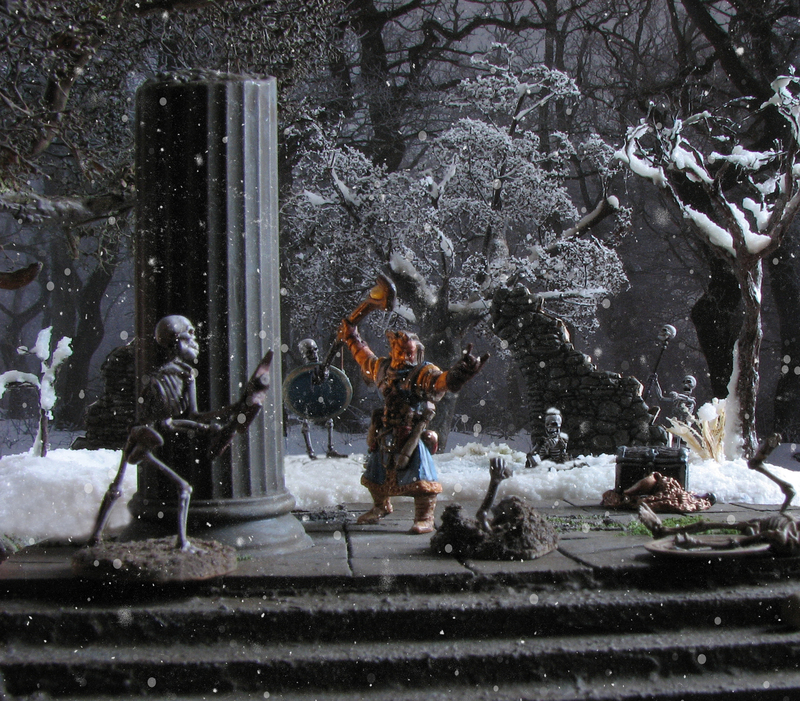 Immediate plans for 2017 are tutorials on snow terrain, including different snow textures such as freshly fallen, slushy and frozen, icicles and frosty spell effects. A WIP picture of Reaper’s Ghost King. Did somebody say frosty spell effects? I won’t focus so much on trees this year, but still intend to publish a tutorial on birch and olive trees. An early attempt at making birch trees more stable and realistic. The tree shape and the bark still needs some work. Another focus will be to start building my modular gaming boards. The laser cut frames still need a small tweak, then they are perfect and I can start with the mediterranean themed ones and also some Frostgrave or generic Fantasy themed boards. This will also include some tutorials on depicting rock. This is how I envision the mediterranean boards to look like. I already featured some interviews with individuals working in the wargaming industry. I would like to continue with this and provide some insights in smaller and less known companies. I also plan to host a terrain building competition following last years Tiny Soldiers Forum challenge. This will be an international competition with a trophy for the winner and, if I can get some sponsors, also some choice additional prizes. This is my wargaming future and plans for the blog in 2017. Let me know below what you plan for your blog in 2017 or what your general wargaming projects will be. Disclaimer: This post is meant as light-hearted fun and if you want to do some molybdomancy yourself please make sure you have a bucket of water nearby, protective gear such as oven gloves and protective eyewear and do it in a well-lit and ventilated room. This should only be done by adults and children must be supervised. I can take no responsibility for any injuries or loss to you incurred whilst you are doing molybdomancy. 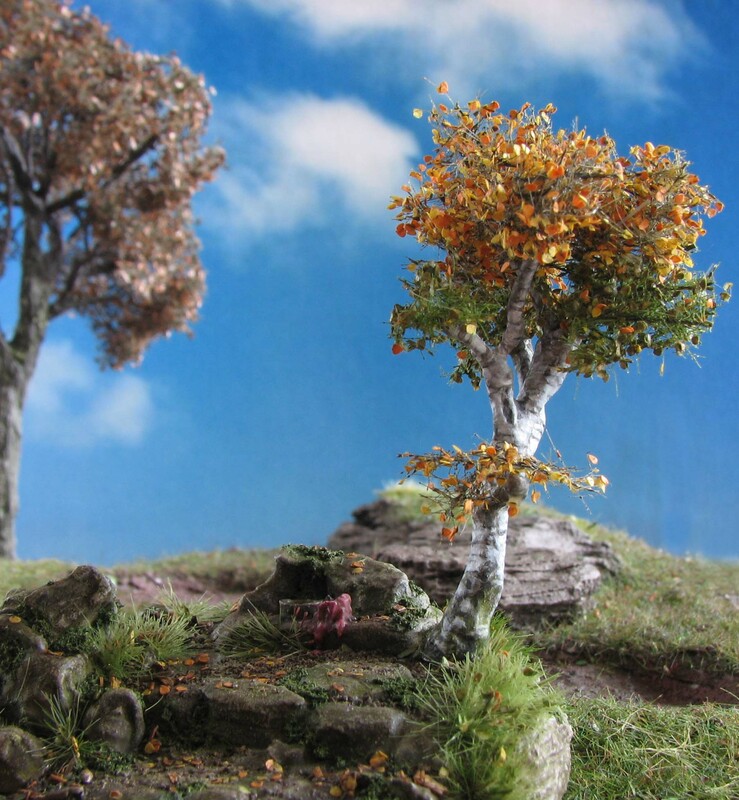 Excellent stuff – looking forward to the Birch tree tutorial in particular. Thank you Kawe. I am in the process of trying some other approaches at the moment to get the best result, but I hope that the tutorial is finished in some point in February. Glad you like it Daniel. A successful 2017 to you. We can only get cockatrice fat in this area. Do you think it would be a suitable substitute? Sounds like there’s great stuff on the horizon-looking forward to seeing your work! You can but try, however, I take no responsibility if you lose your sanity or your soul. Looking forward to your gaming board and D&D related posts! RPG’s are the “only” gaming I get into my schedule these days, so I feel Fantasy will be a major focus for me, too. Water themed terrain! Looking forward to it! I may combine palm trees with a beach setting. Could be a lake. That said some underwater stuff like a reef would be cool, too. I do have some suitable underwater creatures from the Bones kickstarter. The only issue would be how to integrate it into my usual gaming environments. 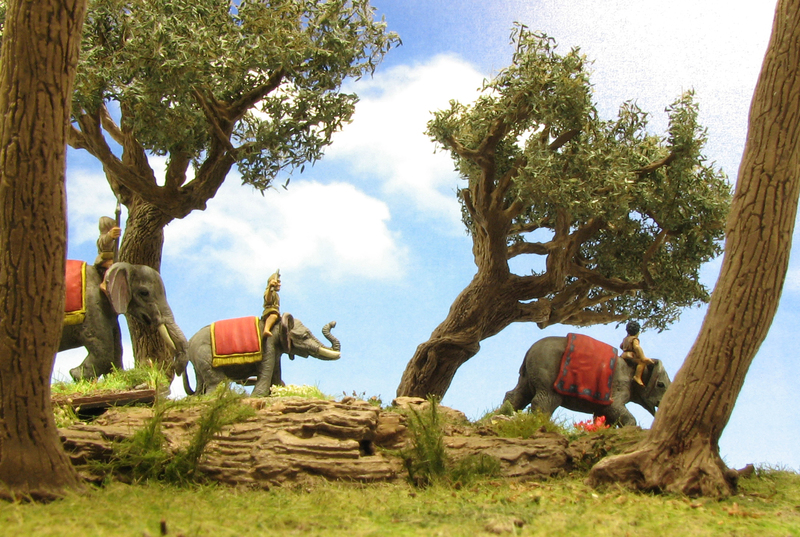 I have a Punic Wars board in mind and the generic Fantasy one (medieval Europe), but palm trees seem not to fit into this one. There may be a commission waiting that will feature palm trees, but more in a desert setting, but I really would like to try my hand at something like that. I got really inspired by Terranscape’s take on the beach board. Just looks stunning.